One of these for sale houses in Manila can enhance your lifestyle as an OFW or Filipino immigrant. A house and lot provides more space in crowded Manila. Various payment options make it flexible to own your dream home. Prices reflect demand for Manila real estate. Location makes living in Manila a comfort and with ease. Modern living blends with having basic needs within reach. But be sure to buy houses safe and flood-free. This extends to nearby areas as Manila runs out of land and space. This makes bargain hunting a challenge. And this is where foreclosed or pre-owned houses come in. A piece of real estate in the Philippines just outside Manila gives you the best of both worlds. You have Manila within reach in an hour or two. Great places to visit in Cavite, Laguna, Batangas and other areas are not far away. This Could Be Your Dream Home in Las Pinas! Walk to the swimming pool and open space next to the compound from this charming 2-storey house with viewing deck, fenced front yard play area and cozy living and dining area. 3BR/4TB, master’s BR w/ TB, LA 192 sqm, FA 140 sqm. Yours at 4.7 million pesos. Or use this form to find your dream home. Help! Townhouse For Foreclosure in Las Pinas! Drive to SM City Southmall in 15-20 minutes from this elegant 3-level townhouse unit with fenced front yard serving as the car garage. Family friendly and low traffic area. 3BR/3TB with attic. FA 120 sqm, LA 58sqm. P1.3M plus P1.2M loan balance. No repairs, ready for move in. Walk to St. Scho and other schools, churches and business establishments from these cluster of townhomes. The area was not flooded even by super typhoon “Ondoy”. 3BR/2TB, attic, laundry/drying area, garden gazebo. Save close to P900,000! Invest in these 2 duplex units and 24 rental houses in Manila near LRT 2 station. The owners’ desire to sell the property makes it a bargain. This is a good source of monthly income. The prime location of this piece of Manila real estate can increase its value in a short period. LA 1,000 square meters. Selling for 9.5M! Drive to malls and schools in 5 to 20 minutes from this elegant 2-storey house with fenced backyard, balcony and bright family room through two main light traffic roads. 3BR/3TB, maid’s room, master’s bedroom with bath tub. FA 230 sqm, LA 140 sqm. Worth 8M, yours for 5M! Bathe in and enjoy the hot spring resorts 5 minutes away from this big house with manicured lawn and garden, large kitchen, wide ballroom area and tower. 4BR/5TB, 4-car garage. FA 460 sqm, LA 390 sqm. Worth 11M, selling for 7M! Your home reflects your changed lifestyle as an OFW or Filipino immigrant. Buying a home fulfills a dream for your family. 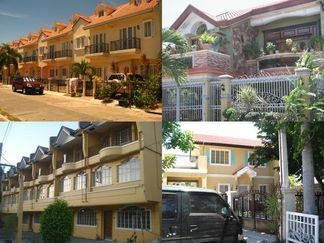 These for sale houses in Manila and nearby areas offer some great choices.